Happy weekend everyone. I hope you all have fun plans to enjoy the spring weather. I am really looking forward to my usual Sunday styling session this week. While I was recovering from surgery I spent a lot of time online shopping (oops) and now I have a pile of new (well, mostly old but new to me) stuff to delve into styling. These 00’s Lauren Ralph Lauren boots were one of my eBay purchases (a steal at 18 dollars). It feels like such a throwback wearing pointed mock-croc ankle boots with flares! These flare jeans are some of my favorite jeans I have ever owned. I was lusting after them when I saw them online, but while I was in New York a few weeks ago I got to try them on in person. So. Good. I have talked about this before, but Moussy is doing some of the best denim out there. The jeans are 100% cotton, and that makes such a massive difference in the quality of the fit to me. These really hug you in and retain their shape! The leg has just the right amount of flare. I think I have met my denim soulmate. These jeans are on sale at Shopbop right now, they look a bit odd on the model because I think they have her in a size that is too big. You can also get these jeans at Frwrd by Elyse Walker and Revolve, but if they don’t have your size, call the Moussy store in Soho. *A note on Moussy sizing: I go up a size in Moussy. I am 5″6 and I am usually a size 24, but here I am wearing the 25! My sister and mom take one size up in Moussy as well, so I would do that if you haven’t tried them before. 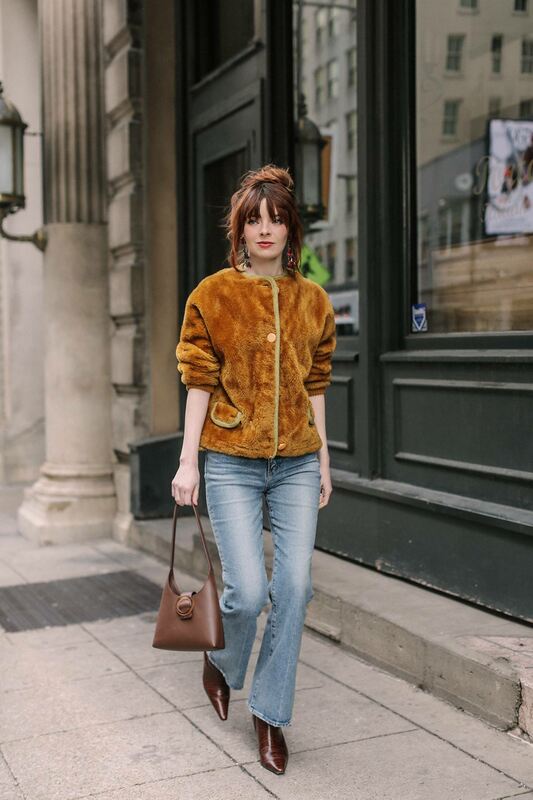 Wearing Moussy flare Luna jeans with a vintage faux fur sweater, Imago-A bag, and Lauren Ralph Lauren 00’s mock croc boots. these flares look great on you. I love how you styled them with those gorgeous boots and that lovely jacket. You look picture perfect. These flares are everything! I seriously love mine! Skinny jeans have always been my comfort zone and the style of jeans I wore (not the most, but the only style I wore). Considering I have shorter legs, I found any other style would cut me off and make me look shorter. However, in the hopes of taking more risks this year, I’ve found that’s not the case because, with some correct styling and choosing the right pair of flare jeans, they can make a killer outfit. High-waisted white flare jeans with a bodysuit or tucked in a t-shirt is my favorite combo at the moment! Have a happy Sunday! nice one i love it.